Get into this summer with the inviting Z-104-DCP Cascade 4 Piece Patio Set. Durable steel frames, UV Resistant Resin Rattan Weave and washable seat covers make this a solid practical choice while aluminum accents and sleek edges round this design out. 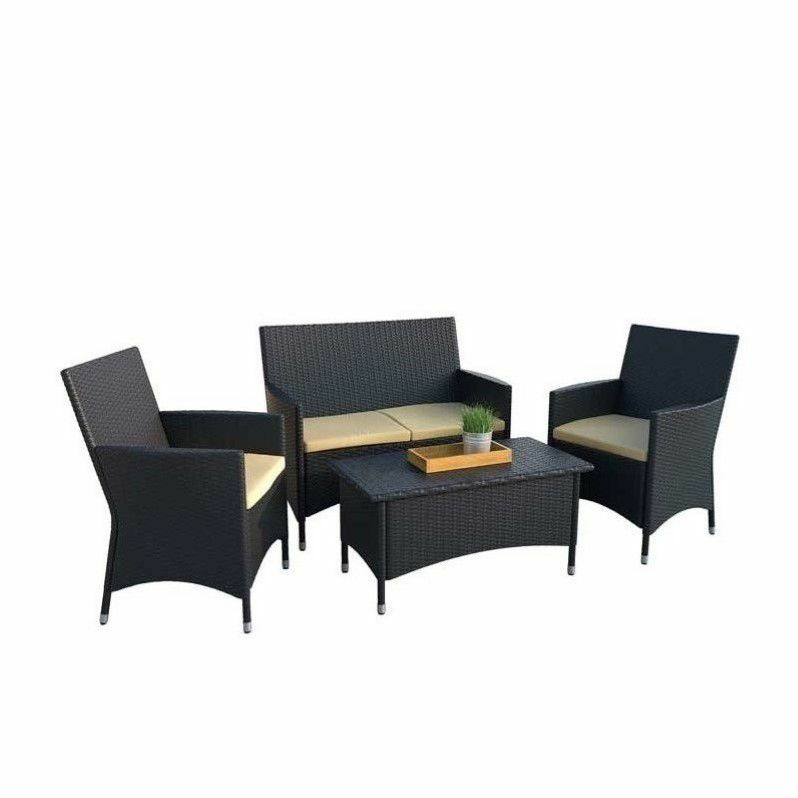 Featured in a Charcoal Black Rope Weave accented with Sunset Yellow seat covers this 4 piece set is a great way to enjoy your outdoor space. The SLAT Large Folding Chair by INTERBUILD comes in a 2-Pack perfect for condo balconies. Made with Forest Stewardship Council (FSC) certified acacia hardwood with a golden teak hard wax oil finish. Designed in Sweden, the elegant SLAT Large Folding Chair holds 330 pounds weight. These outdoor chairs are built with durability in mind but are lightweight and portable, folding flat for easy storage. The SLAT Large Folding Chair is part of the Small Space Solutions product line from INTERBUILD. Take a seat. Crafted with warm brown acacia wood and galvanized steel, the Irina Armchair offers sleek, modern styleand a warm welcome to any outdoor room. Its equally at home on a covered deck as it is under a poolside umbrella. This is a great addition to your home whether in the country side or busy city. Give your porch or patio a touch of Hollywood glam with a pretty and practical set of two Laguna outdoor director chairs. These folding chairs are crafted of eco-friendly acacia wood in a teak finish, and spiffed up with red all-weather Textilene fabric. This is a great addition to your home whether in the country side or busy city. Cascade 4-Piece Patio Conversation Set Get into this summer with the inviting Z-104-DCP Cascade 4 Piece Patio Set. Durable steel frames, UV Resistant Resin Rattan Weave and washable seat covers make this a solid practical choice while aluminum accents and sleek edges round this design out. Featured in a Charcoal Black Rope Weave accented with Sunset Yellow seat covers this 4 piece set is a great way to enjoy your outdoor space. Cascade 4-Piece Patio Conversation Set is rated 5.0 out of 5 by 1. Rated 5 out of 5 by Jocelyn from Perfect size for office patio We bought this conversation set a couple of months ago and it is working out perfectly. Light enough to move around if needed and it looks great!